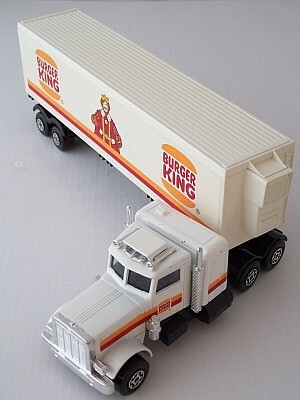 Rare Matchbox K-31 Peterbilt Burger King Refrigeration Truck, in mint condition, original box. 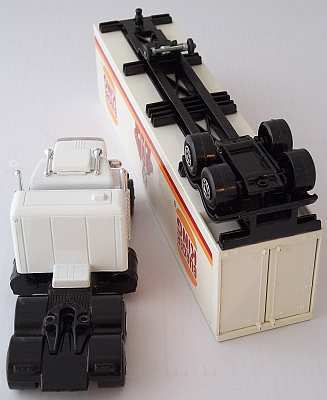 Cast in England, copyright 1978 Lesney Products & Co. Ltd. Truck has a white cab, roof box and sleeper, black chassis and rear doors that open. Toy is unused but the box show natural wear due to age. The box’s front clear cellophane paper has loosened from box; edges of box show wear. Box measures 5 1/2 inches by 13 inches.